Using the tea cozy pattern piece, pin the pattern piece on to the main fabric, this is folded into half (you need 2 pieces), cut out with your fabric scissors. Now do the same with the lining and batting fabric. Place the lining and batting pieces one side. Using the templates, for the tummy, trace on the smooth side of the appliqué paper, adding at least ¼” onto the shape then cut out roughly – there is no need to be accurate at this stage. Iron the tummy appliqué shape to the wrong side of the fabric 8” square piece of fabric. When cool, cut out the shapes accurately on the pencil line. Take one piece of your main owl pattern piece, make a fold mark in the middle (line to be from top to bottom or right side meeting the left side) and the tummy appliqué piece after you have removed the backing paper from it. Position the tummy piece (right side upmost) on the right side of your background fabric, matching the fold lines. Iron into place when you are happy. I move my needle to the most right position, then I use the edge of my open toe embroidery foot as a guide. Pin a piece of stitch ŉ tear underneath design to be appliquéd (optional). With the black thread on top and in the bobbin, outline appliqué in satin or buttonhole-stitch, the tummy into place. Now cut out the eyes on the felt using the pattern pieces. Spray temporary spray adhesive on the back of each eye piece and place each piece in to place, then outline appliqué in satin or buttonhole-stitch. After all the stitching has been done carefully remove the stitch ŉ tear and knot and sew all the thread to the back of the appliqué designs. Press. Now place the appliquéd main piece of fabric right sides facing on to the 2 pieces of main fabric. Sew with natural thread using a ¼” seam allowance. Clip and trim excess fabric, turn right side out and press. Place the two lining pieces right sides facing and a batting piece on either side of them. Sew using a ½” seam allowance. Trim the seam allowance to a ¼”. Pull the appliquéd owl piece over the batting and lining piece, and make it fit each other. Now have an owling good tea! This entry was posted in Craft sewing, Patterns and Tutorials, Quilting and tagged buzy day, crafts, NikkiM, owl tea cozy pattern, tea cozy. Bookmark the permalink. Thanks for liking my “Owl Tea Cozy” post. These are really lovely Nikki….full of personality!! I like this owl. Great for the season. I may have to try it. Nice project and I think I can do it. I need to add this to my list fall project list. Thank you also for liking my Chili and cheddar biscuit post. I am not a seamstress- but these are cute!!! This is really cute. I have to make one for my Aunt who collects owls! Christmas gift win! These are great and, if you are careful in your fabric choice, I assume machine washable too! They are machine washable. Thanks for your lovely comment. I love this…would also make a lovely doorstop! Great idea! Thanks for visiting my buzy day blog. Reblogged this on Sammy Handmade. Thanks for reblogging my Owl Tea Cozy post. Oh my goodness….I just love these! Going right on my “must-try” list! I like your owl tea cozies. I made some receiving blankets the other day from flannelette fabric which are going to a shop where I work. I previously wove 4 baby blankets and have sold two. I make felted tea cozies from wool batts or roving and they have been popular. Thanks for your lovely comment! You sound like a true crafter! Adorable! I’m a birder and LOVE owls, also LOVE tea. I’ll have to make one. Thanks! What a darling feature to add to our to-do list & our table tops! Thank you. 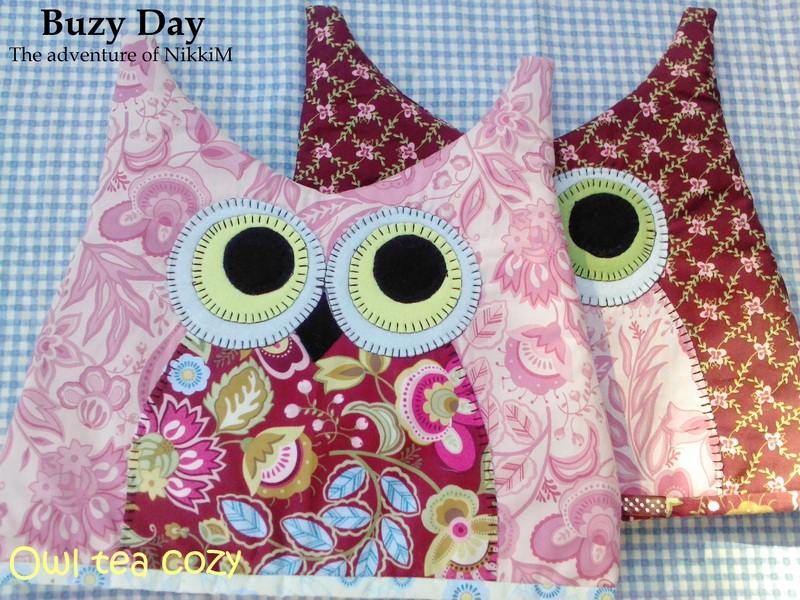 Thank you for visiting my buzy day blog and liking my Owl Tea Cozy post. Thanks for liking my quilled piece. Feeling happy that I came to know of your blogspot, thus…..Your owl tea-cozy is sooooo cute and very neatly done,too. Looking forward to more of your creations…..
Aww so adorable! Will definitely be making these! Very imaginative! Where do you get these ideas from! I have a big group of very creative friends and of course Sandy! Sandy always gets me to think creatively! You too kind! Thanks Angela. heya, is this working in inches or cm? probably a really stupid question…. Most of my work is in inches! The Owl Tea Cozy sewing is in inches but the seam allowance would not make a difference. Thanks so much, I’ve never really done any sewing before in my life, but gave this a go for a Christmas persent- my housemate loves it, thankyou! That’s great! Glad to hear it worked out well! This is such a good idea!!! I MUST buy a proper teapot now to make this!! Your blog is so cute and wonderful!! HI! Thanks for following my blog – I was intrigued by your Owl Tea Cosy blog title, so I just looked it over. I’m NOT a seamstress BUT I have a good friend who is, so I sent her your blog addy – hopefully she’ll come see your very CUTE invention! I missed this post before – love them. they might be just the thing for the spring craft sale here. Q – I’m looking at the Owl Tea Cozy for the millionth time and wondering why I have not made it yet!! Love it. That’s so cute! Love the fabric combination! It’s my pleasure! Thanks for visiting my blog! Thanks for visiting the jelly roll post – these owls are absolutely adorable. Thanks for posting a pattern. I want to make a couple of them! Thanks for visiting my blog! The Owl Tea Cozies I really fun to make! Enjoy! Wonderful Tea cosies. These will be perfect for our church bazaar. Thanks for visiting my new blog. I am new to this so it is encouraging to see what other people are doing. Hi, thanks for the like! I love your site and this pattern! If u have a chance could you enlighten me as to how to make your pattern into a file on here? Thanks!!! The pattern template is saved as a PDF to download read and save you need to have Adobe, this is free and you just download it!